You're not an idiot; you just want simple! Trust me, I get it! You know your car needs some basic cosmetic cleaning and maintenance, but you don't want to make a career out of it. You just want simple and straightforward. And likely, you don't want to spend an entire day researching and reading the endless opinions and reviews from all the so-called experts out in the world. "Darren, I can appreciate a clean car as much as the next guy, but I don't feel like sifting through the endless information trying to come up with a plan on my own. My head spins with anxiety every time I think about it. But I know I gotta do something to keep my car looking presentable." I know there are many car crazy enthusiasts who actually look forward to spending an entire day washing and detailing their car, but your not one of them. Never mind the fact that the industry would have you think you need an entire garage full of detailing products just to keep a single car washed, cleaned, and respectable looking. Just the essentials that you would not have "around the house". Complete; but not completely "complete". Every "car care kit" has holes, or missing essentials depending on who you ask; this one is no exception. You can spend an entire afternoon sourcing all the best of everything. Or you can accept that you need to just get started and add along the way. Perfectly suited for the beginner and truly has a well-rounded assortment of required products. Excellent reviews from beginners to enthusiasts. You can't go wrong with either kit; only you can decide at this point which kit looks like the better "win" for you. You have likely been sitting on the fence for awhile knowing you need to start taking better care of your car. Just know that doing the same thing today that you did yesterday, will deliver the same results. Time to make a change! Accept that this is simply a starting point. You will either realize that either kit is all you ever require moving forward, or you decide to test more and more products. But you have got to start somewhere! Either kit will not only get you started, raise the health and beauty of your car, but give you a new found sense of accomplishment. Dirt and sun are the worst enemies of your cars paint. Follow the labeling instructions on each item. Wash car as frequently as once a week. 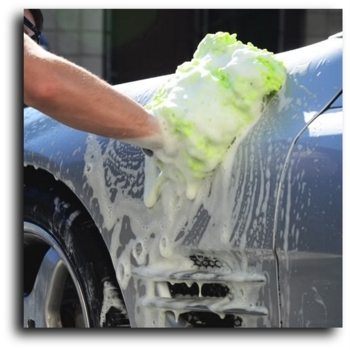 After you have clayed your paint, then you can polish the paint if you are going to polish your car prior to waxing your car. Use any supplied all-purpose cleaners to clean interior of your car after you have vacuumed up any loose dirt/debris first. You may wash and wax your car only. Using the clay bar and polishing are optional. But if you decide to incorporate them into your detailing schedule, follow that exact sequence.